Here are some snazzy birthday facts about 16th of June 1930 that no one tells you about. Don’t wait a minute longer and jump in using the content links below. Average read time of 9 minutes. Enjoy! What day was my birthday Jun 16, 1930? June 16, 1930 was a Monday and it was the 167th day of the year 1930. It was the 24th Monday of that year. The next time you can reuse your old 1930 calendar will be in 2025. Both calendars will be exactly the same! This is assuming you are not interested in the dates for Easter and other irregular holidays that are based on a lunisolar calendar. What day is June 16 this year? There are 56 days left before your next birthday. You will be 89 years old when that day comes. There have been 32,451 days from the day you were born up to today. If you’ve been sleeping 8 hours daily since birth, then you have slept a total of 10,817 days or 29.62 years. You spent 33% of your life sleeping. Since night and day always follow each other, there were precisely 1,099 full moons after you were born up to this day. How many of them did you see? The next full moon that you can see will be on May 18 at 21:13:00 GMT – Saturday. Fun stat: Your first one billion seconds (1,000,000,000) happened sometime on February 22, 1962. If a dog named Ayala - a Boykin Spaniel breed, was born on the same date as you then it will be 416 dog years old today. A dog’s first human year is equal to 15 dog years. Dogs age differently depending on breed and size. When you reach the age of 6 Ayala will be 42 dog years old. From that point forward a medium-sized dog like Ayala will age 4.5 dog years for every human year. View the complete list of June 16 celebrity birthdays. Who are the famous June 16 birthdays? Here’s a short list of famous people in history who were born on Jun 16. View the complete list of June 16 famous birthdays. 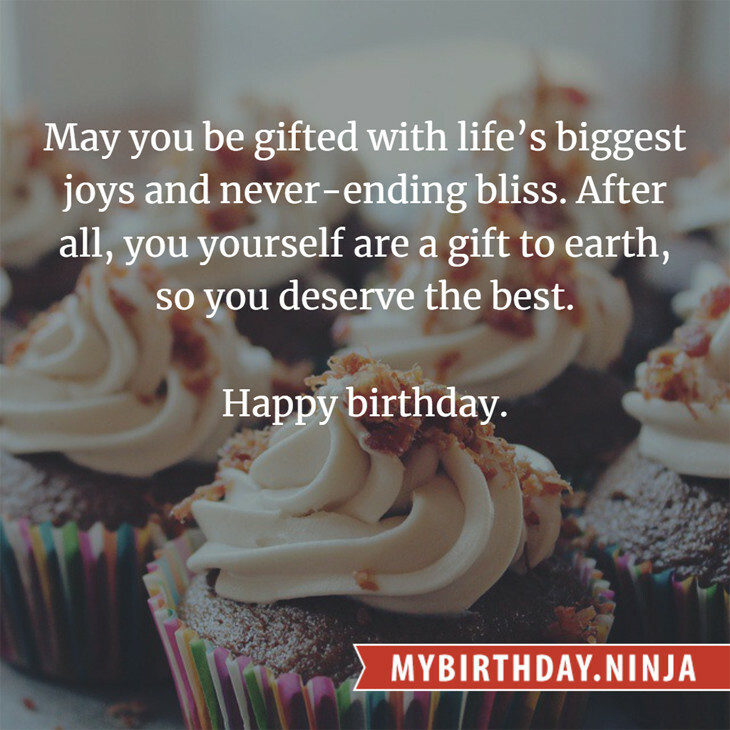 What happened on my birthday – Jun 16th? Yazdegerd III ascends to the throne as king (shah) of the Persian Empire. He becomes the last ruler of the Sasanian dynasty (modern Iran). Mary, Queen of Scots, recognizes Philip II of Spain as her heir and successor. The University Tests Act allows students to enter the Universities of Oxford, Cambridge and Durham without religious tests (except for those intending to study theology). A treaty annexing the Republic of Hawaii to the United States is signed; the Republic would not be dissolved until a year later. The Whampoa Military Academy is founded. A Communist government is installed in Lithuania. Members of the Malayan Communist Party kill three British plantation managers in Sungai Siput; in response, British Malaya declares a state of emergency. The largest single-site hydroelectric power project in Canada is inaugurated at Churchill Falls Generating Station. Soweto uprising: A non-violent march by 15,000 students in Soweto, South Africa turns into days of rioting when police open fire on the crowd. Revolutions of 1989: Imre Nagy, the former Hungarian Prime Minister, is reburied in Budapest following the collapse of Communism in Hungary. View the complete list of June 16 historical events. Curious about this Pink Topaz? This is a party item you can activate and send to your friends when you play the free game Jump Birthday Party. It’s a fun and easy-to-play mobile game for all ages. Get free 1,000 gold coins when you download today! What does my birthday June 16, 1930 mean? Your birthday numbers 6, 16, and 1930 reveal that your Life Path number is 8. It represents experience, authority and endeavour. You are gifted with natural leadership and the capacity to accumulate great wealth. The following celebrities also have the same life path number: Amy Madigan, Jacky Wu, Sasha Jackson, L. M. Kit Carson, Joni James, DJ Muggs, James Sutton, Matt Knudsen, Diana Lynn, Sarah Gilman. 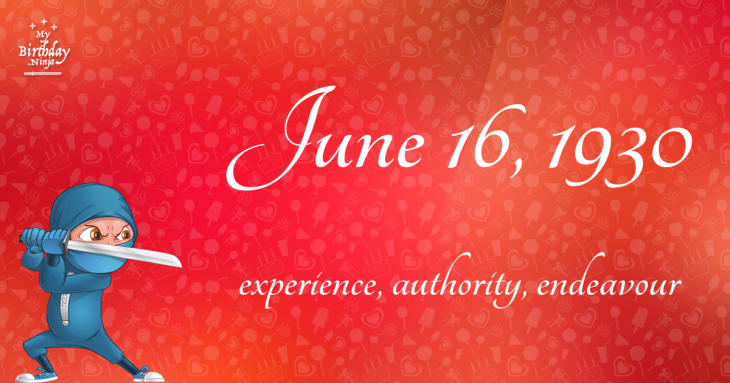 What is the birthday horoscope for Jun 16, 1930? The Western zodiac or sun sign of a person born on June 16 is Gemini ♊ (The Twins) – a mutable sign with Air as Western element. The ruling planet is Mercury – the planet of communication. According to the ancient art of Chinese astrology (or Eastern zodiac), Horse is the mythical animal and Metal is the Eastern element of a person born on June 16, 1930. What is the birthstone for June 16? Fun fact: The birth flower for 16th June 1930 is Rose for devotion. What is the Love Match for Jun 16, 1930? When it comes to love and relationship, you are most compatible with a person born on October 28, 1910. You have a Love Match compatibility score of +131. Imagine being in love with your soul mate. On the negative side, you are most incompatible with a person born on January 4, 1931. Your incompatibility score is -174. You’ll be like a cat and a dog on a love-hate relationship. Arf-arf, I want to bite you. Meow-meow, stay away from me! What is a good birthday trivia for June 16? What is the popular baby name on 16 Jun 1930? What’s your bizarre Florida Man story? The #FloridaManChallenge is breaking the Internet and social media. Some crazy men, women, or creatures from the Sunshine State are making headlines every day of the year including your birthday. Try this fun exercise. Pick your search engine of choice and type in “florida man June 16” and see what kind of wild news headline you will get. This viral craze started in 2013 and gets resurrected now and then. The latest was from Tumblr and found its way to Twitter. As they say, the rest is history. Here’s a quick list of all the fun birthday facts about June 16, 1930. Celebrities, famous birthdays, historical events, and past life were excluded. Try another birth date of someone you know or try the birthday of these celebrities: January 6, 1982 – Tiffany Pollard, American actress; June 26, 1993 – Ariana Grande, American singer-songwriter, dancer, and actress; February 5, 1985 – Tatiana Silva, Belgian model, Miss Belgium 2005.